Financial Courses are offered in India at various levels. There are courses after intermediate, after graduation and after masters. Some of the courses are also offered as skill enhancement programs for working executives. These financial courses can be grouped in different ways there are statutory courses that are offered by bodies set up by acts of parliament, courses offered by various universities in India, courses offered by foreign boards by setting up representative boards in India. We have enumerated the all of the above type of courses and provided links to the website of the institutes that offer the best programs in the above domains of finance. Personal Finance means finance related to individuals. In personal finance courses the participants are taught How to manage finances of an Individual? The participants learn to create personal financial statements, analyze finances of individual, advice individuals on managing their finances in order to meet their financial goals. In a personal finance course, students learn how to counsel individuals on money-saving techniques and budgeting. Personal finance topics covered include auto loans, mortgage loans and budgets. Taxation, including saving money to pay taxes and getting the most out of deductions, is also covered. Personal Finance Courses can be taken after intermediate or graduation but it is advisable to pursue these programs after graduation. As the level of intellectual ability and pre-requisite knowledge required to pursue these programs is such that a graduate or students nearing completion of their graduation are better placed in doing so. Corporate Finance deals with managing and analyzing finances of a Company or a Business. In corporate finance the sources and uses of funds is dealt for. In a corporate finance course the students learn maximize the wealth of the shareholders of a company by finding out best source of capital and also learn how best to deploy this capital for long term profit maximization for a company. Students learn about possible financial problems, such as the cost of capital and the risk of investing in a certain product or company. Corporate Finance Courses help the students develop skills in Financial decision making for a Company including capital budgeting/corporate investment, capital structure, corporate sources of funding, dividend policy and corporate contingent claims, international finance, and financial risk management. Some areas of corporate finance that are also very important are leasing, mergers and acquisitions, working capital management, standard theories of risk and return and valuation of assets. There are specialized courses covering a particular niche of finance. 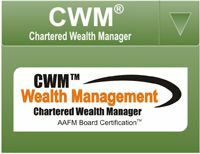 Chartered Wealth Manager® (CWM®): The CWM® Program is offered by the American Academy of Financial Management USA. 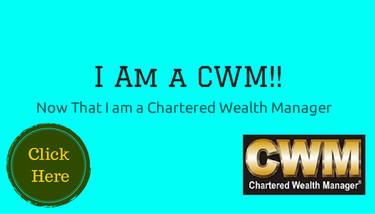 There are over 50,000 CWM Certificants all over the globe occupying top positions in the Wealth Management and Private Banking sphere. 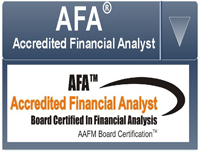 The program is offered in India by American Academy of Financial Management India set up by AAFM USA. The program covers both Indian and Global content. It prepares the participants in the art and science of managing wealth of Ultra Affluent Clients. The participants build skills in managing local investments as well as global cross border investments. The program curriculum is divided into 2 levels; level 1 is the foundation level and level 2 is the advanced level. 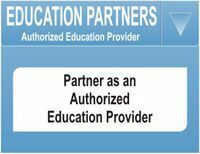 The program is offered through Authorized Education Providers of AAFM India which include organizations like ICICI Direct, Indiacan a Pearson and Educomp Company etc. 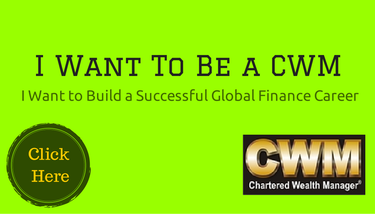 CWM® is the highest global designation in wealth management globally and opens doors for International Jobs in top Banks and Financial Institutions. The program can be pursued after intermediate but the participants need to have passed graduation to be awarded the CWM® designation. The program can be completed in 3-6 months. 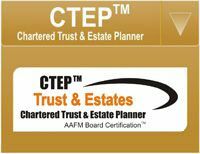 Certified Financial Planner CM (CFPCM): The CFP program is offered by Financial Planning Standards Board based in USA. The program enables the participants to learn Financial Planning for individuals. The program is divided into six modules and a participant needs to clear five examinations to qualify for the program. CFP program is the highest global designation in Financial Planning which equips participants to advise individuals in planning for their financial goals. Students need to be intermediate with 3 years of work experience to be awarded the CFPCM Designation. Wealth Management is an advanced area of Financial Planning incorporating Financial Engineering, philanthropy, tax issues and portfolio management. The Professional Sequence in Wealth Management provides financial planners with the training to help wealthy investors navigate their particular challenges and opportunities. Chartered Accountancy (CA): It is one of the most widely sought after finance professions in India. A practicing CA is guided by the rules of Institute of Chartered Accountants of India ICAI and has got the legal right to file for Income Tax Returns ITRs of clients and doing audit of companies. CAs earn hefty fees for the services rendered. CA is a sure shot way of getting a job or starting your personal practice because the economic scenario implies that there will be new businesses opening every time and it is compulsory under government regulations for a company to get audited by a CA. This course is a optimum blend of practical and theoretical education. It consists of three levels of examinations and three years of practical training under a practicing Chartered Accountant. The Chartered Accountancy course is considered to be one of the rigorous professional courses in India. Preparation of CA happens in multiple phases and if pursued seriously it can be cleared in around 4 years. The first level of examination for CA: The CPT or Common Proficiency Test is the first level of Chartered Accountancy examinations. A person can register for CPT after completing Grade 10 and take the exam after completing High School (Grade 12). The second level of examination for CA: IPCC or Integrated Professional Competence Course is the second level of Chartered Accountancy examinations. A person can take the IPCC Examination after passing CPT and nine months of study. IPCC has two groups of seven subjects. Group - I consists of four subjects and Group - II of three subjects. A passing grade is awarded if the candidate obtains 40% marks in each subject and 50% in the aggregate in each group. The third and final level of examination for CA: CA Final Examination is the last and final level of Chartered Accountancy Examinations. Any person who has passed both the groups of IPCC, during the last six months of articleship can take the Final Examination. This exam consists of two groups of four subjects each. A passing grade is awarded if the candidate obtains 40% marks in each subject and 50% in the aggregate in each group. Actuaries: Typically an Actuary uses financial and statistical techniques to solve real business problems, particularly that involving risk management. But what sets them apart from their counterparts in other professions is the natural mathematical, economic and statistical aptitude, awareness and the ability to apply these to situations in the real financial world. The program is offered by Institute of Actuaries formerly known as Actuarial Society of India. The program has a total of 15 papers after the completion of which the person can get jobs in insurance sectors namely premium calculation, policy formulation or insurance marketing with an average package of around INR 50 lakhs. Actuaries have an added advantage that the person can do a job along with clearing the papers and each successive paper adds to the existing pay package the person is getting. There are around 200 fellow actuaries in India. The Chartered Financial Analyst (CFA): Program is a professional credential offered by the CFA Institute (formerly AIMR) to investment and financial professionals. A candidate who successfully completes the program and meets other professional requirements is awarded a "CFA charter" and becomes a "CFA charter holder." The program prepares the participants in becoming proficient in Financial Analysis, Equity Research etc. The CFA charter is a qualification for finance and investment professionals, particularly in the fields of investment management and financial analysis of stocks, bonds and their derivative assets. The program focuses on portfolio management and financial analysis, and provides a generalist knowledge of other areas of finance. Additionally, the CFA charter has experienced increasing relevance and demand within corporate finance. The basic requirements for participation in the CFA Program include holding or being in the final year of a university degree (or equivalent as assessed by CFA Institute), or having four years of qualified, professional work experience in an investment decision-making process. To obtain the charter, however, a candidate must have completed a university degree (or equivalent) and four years of qualified, professional work experience, in addition to passing the three exams that test the academic portion of the CFA program, as discussed below. Candidates take one exam per year over three years (assuming a pass on the first attempt). Fees as of December 2009 for each exam range from $710 to $955, depending on the date on which the candidate registers to take the exam, plus an additional $400 to $480 for program enrolment for new members. 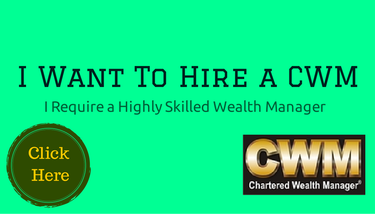 Chartered Wealth Manager is one of the New Programs available in India so it can give a first mover advantage. no doubt, course material provided by cwm body is very detailed and comprehensive . But education provider is not sending me the workboks.I am keen to take the exam. please tell me. i m working as an ACCOUNTANT in kuwait . i ve 4 yrs experience in same field . which course is better for me in future. plz send me details course/ duration/ course fee/ . Currently i am working as a Accountant.. i am thinking of doing one course in finance related.. which course i should have to do.. and i am also thinking of going to abroad.. please suggest me better PG course.. I just want to know the details of various finance courses that will be of great help after completion of MBA. Sir I am doing MBA finance. After completion of course which certificate course better to do. Please advice me sir. Hi, my friend has enrolled for a specialized MBA finance program with IIMT, Gurgaon. They have a unique program where they offer 2 years Paid internship in Delhi/ New York/ London with evening and weekend study. It seems to be quite good since you start earning experience with some of the best finance companies even before the finish of the program...check out www.iimtobu.ac.in. All the best. I think someone who wishes to pursue finance will always want to know more about the different finance courses in India and what their scope is. You have shared a list of interesting finance courses. This is sure to help candidates who plan to pursue finance. Thank you for sharing this post. Hello sir I did MBA -Finance and having 2 yrs exp in banking but not getting good package as expected though I did JAIIB-IIBF and 3 NCFM certifictaions so what I need to do for growth in my carreer???? Hello Sir/Mam, I have done B Com (A/c) Hns. & MBA - Finance & Having 5 years exp in Finance & Accounts. Now i want to do another course which give me best career in my future life. Kindly suggest me about it. I have done M.Com. & MBA in Finance & doing job as an accountant in good company. Now i want to do another study or course which give me best career & earning in my future life. Kindly suggest me about it. in finance which is the best course for making a finance manager? ple. give your suggest which is the best way to making a finance manager. if i select the ICWA so is it correct way? I am a C.S. by profession and want to go for any finance course depending on the current job scenario. Kindly guide me as to which course i should choose. Currently i am working as a Accountant.. i am thinking of doing one course in finance related.. which course i should have to do.. please suggest me better PG course..
Hello, do you have any advanced accounting or finance related short course training for one week in India? if yes, then please send me the contents, timing and tuition fee for per participant.